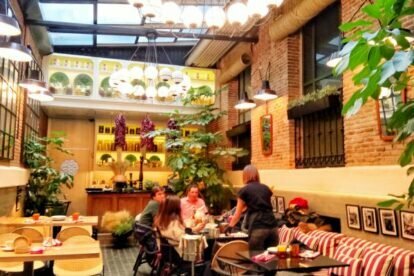 Fellina is in one of the most charming neighborhoods of Madrid: Chamberí. I love walking in this area and finishing my stroll with a delicious pasta dish in Fellina. The atmosphere will enchant you with its natural light, wood and homemade Italian food with a sophisticated touch. Fellina has four beautiful spaces for you to enjoy the dishe, and a cellar, where the hours will pass without you realizing. Endless traditional proposals made with the best ingredients on the market. Long live pasta and Fellina. This restaurant is perfect for couples or large Italian-style groups. They have long tables that can accommodate more than 8 people. And while you tune in with the atmosphere and the conversations and immerse yourself in the wine list, you will already start thinking about wanting to return to Fellina. The burrata with tomato cannot be missing from your table. Everything tastes like “nonna” cuisine, as if you were going down to the south of Italy for a moment with its unforgettable smells and tastes. Fellina makes a particular tribute to the great Fellini and his famous phrase “Life is a combination of magic and pasta”. La vita e bella and more with Italian food. Long live Parmesan and pizza!